As you may know I recently started a sensor trial, which started off really well. I got my sensor fitted everything was running smoothly until I decided I was going to go to the supermarket. The moment, I stepped into the supermarket doors. Of course I totally ignored it and kept walking, there were so many people going in and out of the supermarket. Major Side note: I was coming into the supermarket and in any case it’s not in my nature to shop lift. I continued with my shopping, arrived at the till, paid for my goods and went through another set of alarms (WHICH WENT OFF). I looked around because, that surely was not me! So I kept on walking. I reached the exit and walked through the doors with a herd of other people (YES the alarm went off again)! Still oblivious I continued to walk towards the car and go home. Off I go to the supermarket nice and early to pick up a few things. Side note: I love going to the supermarket nice and early. Its empty and I can just pop in and pop out. Job Done! I reached the entrance and BEEP, BEEP, BEEP, BEEP! OK I was the only one walking through, was that me? The guard just nodded and smiled so I smiled back and continued walking in. Shopping done and paid for. I approached the first alarm, BEEP, BEEP, and BEEP! No that was definitely me that time. I decided to turn around and go back to the lady at the till to make sure there were no tags in my bag. The lady checks and finds no tags. She encourages me to just go through. BEEP, BEEP, BEEP! That now confirmed that it was me beeping. So embarrassing! I had a feeling that perhaps it was something to do with my sensor. I was totally dreading going through the exit alarms so I decide to let the guard know I was wearing a sensor and it might possibly go off as I go through the alarm. I showed him my receipt and my pump just in case he didn’t believe me. Off I went! I continued to use the sensor but I just felt that whenever I tested my BGL it wasn’t even close to the numbers on my pump. After 12 days the sensor totally failed and produced an error message that read ERROR 0. After 5 hours the sensor remained like this so I decided to call Animas (they are so helpful) and I ended up having a lengthy conversation with them. The lady I spoke to asked me several question and tried to get the sensor running again. However she finally said, that the sensor had failed and that I should remove it all together. When I removed the sensor it was bent and had barely pierced my skin. I also mentioned my beeping every time I went through the supermarket alarm. She said that it’s possible that the transmitter may have been faulty. I gave her the codes on both the sensor and transmitter and I was sent new replacements the following day. I then restarted my sensor trial and I’m now on day 5, no errors or false readings. My BGLs have been spot on when I cross reference them with my BGL on my BG meter. I’m starting to see a clearer picture of what my BGLs are doing and have been able to make adjustments in my basal rates. It still needs some fine tuning but I feel I’m finally starting to iron out all the lows. Has this (the beeping) ever happened to anyone else? Or have you ever had a faulty transmitter or sensor in general? My first transmitter was deemed to be faulty. I owned it for a month before Medtronic realized that it wasn’t my calibration timing that was making for inaccurate readings. They sent me a new one two days later and it’s mostly been accurate ever since. 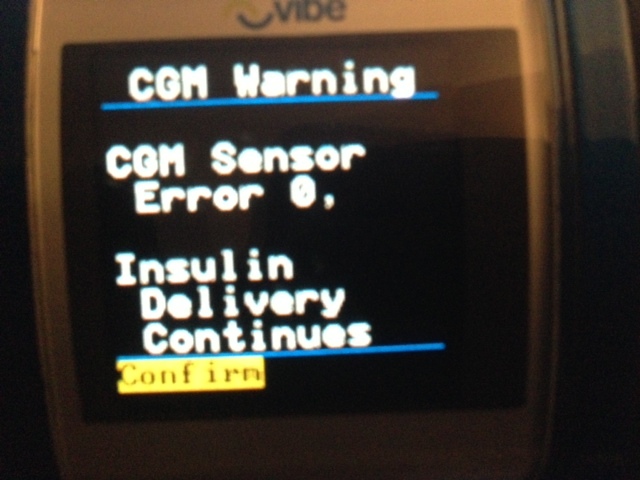 Awww that’s good to know that I’m not the only one to have a faulty sensor or transmitter. I was beeping everywhere I went hehehee!